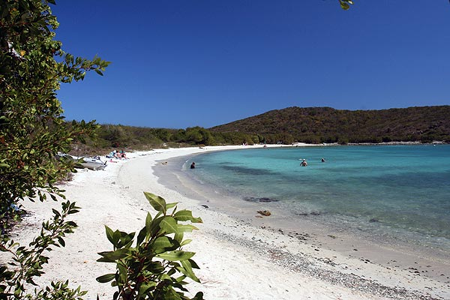 When it comes to snorkeling in St. John, Salt Pond is #1 on our list. It has the best of both worlds when it comes to snorkeling with sandy shores and gorgeous natural reefs. From the beach, you can see huge rock structures in the middle of the bay. If you venture the 5 to 10 minute snorkel trip out to the rocks, you will see why we think Salt Pond is the best snorkeling spot in St. John. Tropical fish surround the two rocks, and on a clear day it’s not uncommon to see 20lb – 25lb fish swimming right next to you. Plus, there are regular sightings of sea turtles and stingrays. Please remember the golden rule of snorkeling: always enjoy looking but do not touch. This will keep both you and the sea life safe while you enjoy exploring their underwater habitat. To get there it’s about ¼ of a mile walk to the beach at Salt Pond from the Salt Pond Bay Trailhead in the Virgin Islands National Park. Signs will guide the way. There are no vendors at Salt Pond, so you will need to bring your own water, snacks, and beach gear. Number two on our St. John snorkeling list is Trunk Bay. 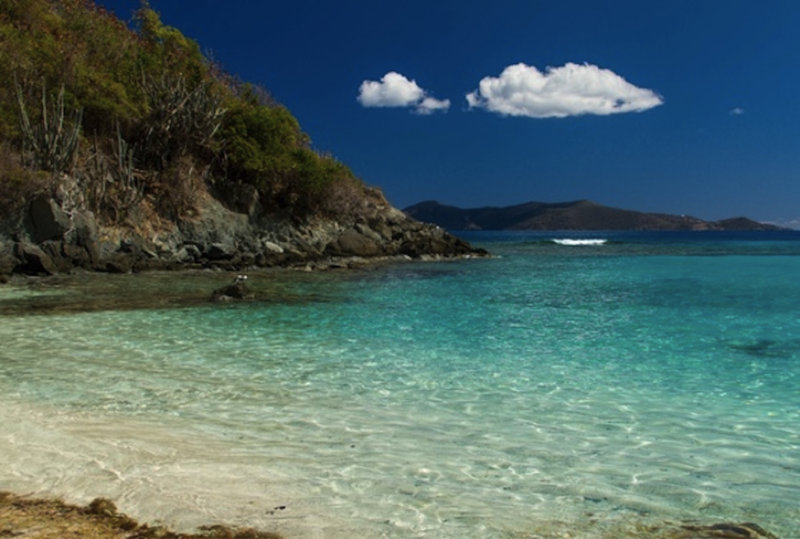 This is the most famous and arguably the most beautiful beach in the Virgin Islands. 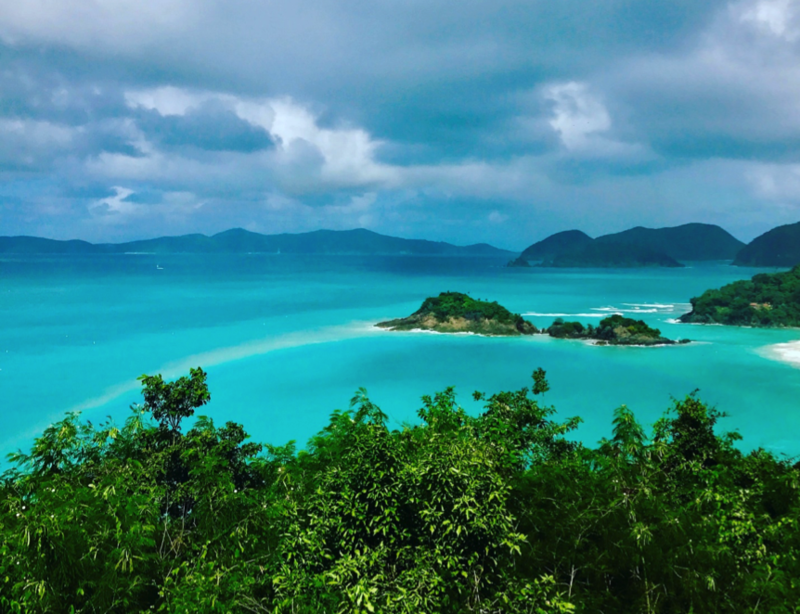 Trunk Bay has a gorgeous white sand beach and crystal clear water, plus, an amazing underwater snorkeling trail. You heard it right, Trunk Bay has an underwater snorkeling trail and it’s touted as one of the best attractions in the Virgin Islands National Park. The underwater path of arrows will guide you on an adventure past a vast variety of corals and colorful fish. It’s an easy 15-minute drive from Cruz Bay and there is a $5 fee to enter the beach, but it’s well worth the cost even for the views alone. 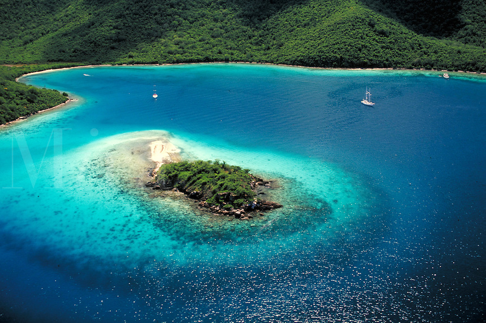 Waterlemon Cay is #3 on our list for best St. John snorkeling spots. Waterlemon Cay is located at the very end of the north shore beaches of St. John. You can park at the Annaberg Sugar Mill Ruin and take the walking path on the shoreline for about 20 mins. It’s a bit of a hike, but well worth it! You can expect to see a diversity of animals on the hike including deer, mongoose, and land crabs, plus gorgeous flora and fauna. Once you kick off your hiking shoes and grab a mask and snorkel, it will be time to see Waterlemon from the best viewpoint, in the water. As soon as you enter the water you will be in the midst of sea turtles, eagle rays, and even small sharks. The underwater wildlife here is pretty incredible! Just be careful as the current can pick up strength while moving around large masses so we recommend snorkeling counterclockwise. Jumbie Bay is last on our list for the best St. John snorkeling spots. If you want to feel like a cast away, then this is the beach for you. Other than a few palm trees to keep you company, you’ll have the beach to yourself. Swimming to the snorkeling spots is pretty easy; just use caution on windy days, as it can get pretty rough over the reefs. Only about 100 ft off shore are a variety of caves and crevices where you can spot a wide variety of fish. It is not uncommon to see lobsters, snapper, sea turtles, and other marine life. Getting there is easy, just look for the sign right before Trunk Bay. There is limited parking for this beach, only allowing for 6 cars at a time, so get there early to enjoy a gorgeous day of snorkeling. If you don’t have the time to hit one of these unique spots on your own, then join us on one of our snorkeling trips!